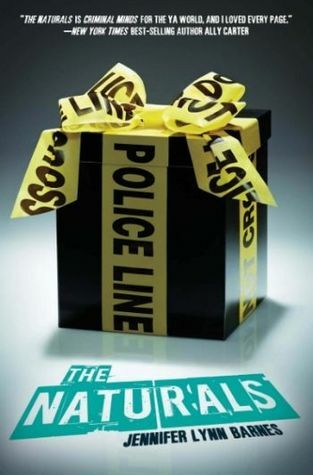 The Naturals is where YA fiction meets CSI. Once you suspend reality and the impossibility of such a program existing, then it’s a fascinating look into the psychology of profiling. Seventeen-year-old Cassie is recruited to an FBI teen program called ‘The Naturals’. This program is for teenagers who show natural tendencies that indicate they will excel at solving crimes and the FBI want to both learn from their natural skills and zone them even further by letting them loose on cold cases. Unfortunately for Cassie, even cold cases can be red hot dangerous and she is putting herself right in the middle of the danger zone. What I loved about this book is the profiling. I’m personally fascinated by this and this book shows you some basics about how you build a profile about a criminal just based on a few key observations. Cassie’s mother was a psychic and Cassie has natural instincts on how to read a person and draw a picture about their life just based on their behaviour, personality and environment. “People were people, but for better or worse, most days, they were just puzzles to me. Easy puzzles, hard puzzles, crosswords, mind-benders, Sudoku. There was always an answer, and I couldn’t stop myself from pushing until I found it!" Her training on the FBI program develops her solving skills even further and I was fascinated by the examples used in her training about how a few key observations can tell you so much. Cassie meets a number of other ‘Naturals’ within the program and they all have their own unique talents such as Michael who can read emotions, Dean who is another profiler and Lia who can spot a lie a mile off. It was intriguing reading about the other skills but none of them appealed to me as much as the profiling. All were interesting secondary characters though and they all have quirks that make them appealing to spend time with. What I do have to say about this book is that, I don’t really get a feel for Cassie outside of the profiling. I don’t know what she likes or dislikes apart from the fact that she is a bit of a loner. I think her personality could be developed further and if it wasn’t for how much I loved the profiling this book would have gotten a much lower rating. I want to really know my MC and here I feel I don’t, which is odd especially as this book is told in first person perspective. I like Cassie but she needs a lot more character development to make her more multi-dimensional. And if you put a bunch of teenagers in a house together there is going to be an inevitable romance. In Naturals, there are two other guys in the program that Cassie is drawn to and she ends up kissing both but that is as far the relationship went. There is a romantic tension between Cassie, Michael and Dean and I’m not really sure which one Cassie prefers and I don’t think she does herself either. The pace of the book is snappy. I really wanted to keep reading and for a YA book, it is quite gory and scary at times. Nothing too in your face but I definitely felt the chill factor that you normally only get in adult thrillers which was a pleasant surprise. I like to be scared when I read a crime-fiction book and this book delivered on that. Plus it wasn’t overly predictable and I was taken by surprise at the twisty twist and I love when that happens. Overall a very enjoyable read and I would definitely love to read more books about Cassie and the other naturals. And hopefully there are more to come as there is a lot that has yet to be revealed about Cassie’s background and I want to know if she chooses Michael or Dean! Thanks to NetGalley and Disney Book Group for giving me a copy of this book in exchange for an honest, unbiased review. Sign into Goodreads to see if any of your friends have read The Naturals. 0.65% "I like her profiling techniques, think this will be a good read. Very YA CSI'ish." 40.0% "So much better than I expected. I love the profiling!" I really enjoyed it! Which surprised me YA and crime fiction don't usually work. Great! Hope you enjoy it Suzanne, will love to hear your take on it!